I'm not sure if this has been posted anywhere else here but Peter Jackson is doing a film using footage from the Let It Be sessions. There's a whole thread about it. Thanks for the heads up. I thought it would be in the news section so I was surprised it wasn't and just posted it without having a look. Oops! Almost forgot to post about this in all the LIB excitement today. 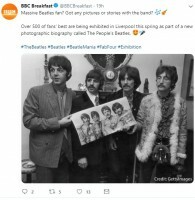 Barry Miles (aka Miles, famous '60s figure, author of Paul's Many Years from Now) turned up on BBC Breakfast this morning looking for fan pictures and associated stories for a new book and Liverpool exhibition. Commissioned by Photobox, The People's Beatles is a groundbreaking global project that aims to crowdsource, edit and publish a unique photographic biography and picture archive of The Beatles - as seen exclusively through the eyes and camera lenses of the fans who were there. Launched to commemorate the 50th anniversary of The Beatles' last ever live performance which took place on the roof of Apple Records in London on 30th January 1969, The People's Beatles will provide a people’s portrait charting the astonishing journey from unknown Liverpudlians to the most popular band in the history of music - covering everything from Hamburg to the Cavern Club, the birth of Beatlemania, to the European and American tours; from the Magical Mystery Tour , through to their final album, Let it Be, and beyond. I couldn't resist laughing about the Google part..."Beetles"! J,P,G and R are like vaporized! "I've got two gentlemen who claim these songs are theirs." Clearly WSC has not been erased! Also: Kate McKinnon. YES PLEASE. I am looking forward to a new book by Barry Miles. Hah I came here to post about that movie because the saxophone teacher at my school told me about it, but it seems RN is on the ball as always. It looks awful- I thought we all agreed Ed Sheeran wasn't allowed in films or tv anymore when he showed up in Game of Thrones. His Bridget Jones cameo was tolerable because it was like 5 seconds but stay away from my stuff Sheeran. The whole 'writing Beatles songs before the Beatles did them' has been done before in Goodnight Sweetheart. Also, is there no other young upcoming British actress apart from Lily James? She's in practically every film that's been made in Britain for the past 3 years! In saying that, if it gets a big release I'll probably go see it BUT it still looks terrible! That’s what I’m hoping. Getting their name out there in some form has to help. Former Beatles haunt, The Grapes on Mathew Street, closed its doors at the beginning if June, and it's unknown why, and when it will reopen, though its owners expect that it will. Seems there are problems with the current people running it. Talk of unpaid bills. It reopened but problems continued with the licensee until the owners, Star Pubs & Bars, repossessed the pub in December, immediately seeing it closed again. 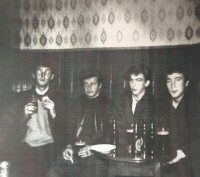 The pub has been now refurbished, sympathetically to its Beatles history one would hope, and the Liverpool Echo reports it will reopen its doors tomorrow (22 February) at 6pm. It's good to see this former Beatles haunt reopening its door under new management. Myself and AG enjoyed taking our pictures on the same bench seat where once their bums had sat. Total and utter fecking BS. There is no way that Paul and Ringo are about to tour with holograms of John and George. This should be in the LOL thread!!! EDIT: I just noticed it's their April Fool from last year! Even less reason for it to be here. Now, this isn't quite as impressive as it first seems as they count each disc separately, so it has always had an advantage over their other albums. 1 sale of AR or Pepper scores 1 toward its certification, 1 sale of the WA scores 2, built-in advantage. And if bonus discs added to expanded reissues are also counted, that would have last year's editions giving scores of 3 & 6/7(?) toward certification, and last year's reissues sold very well. "A&E will premiere the two-hour special John and Yoko: Above Us Only Sky next month as part of the network’s "Biography" strand."